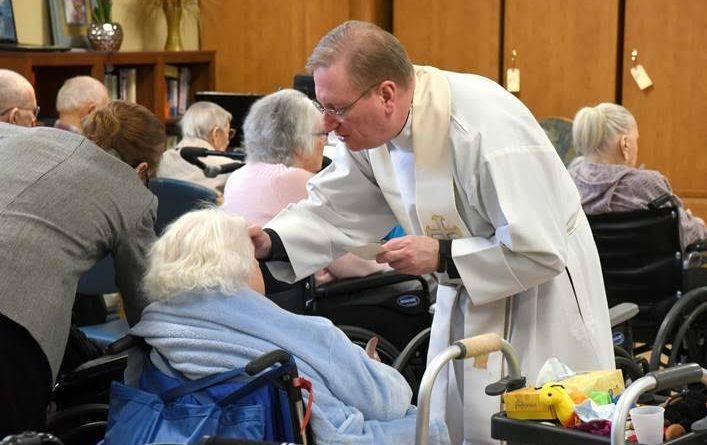 BIDDEFORD—In commemoration of the World Day of the Sick, Bishop Robert P. Deeley celebrated a Mass of the Anointing of the Sick at Saint André Health Care in Biddeford, on Sunday, Feb. 11, asking God to “ease the sufferings and comfort the weakness” of those gathered. “What a wonderful celebration this is and what a wonderful opportunity to renew ourselves in the love of God and to show God’s care for the sick by these sacraments of healing, sacraments of love, sacraments of care,” Bishop Deeley said. The sacrament of the anointing of the sick is one of the ways in which the Church carries on the healing ministry of Christ. The sacrament may be administered to anyone suffering from serious or chronic illness, facing surgery, or weakened by advancing age. Through the sacrament, those anointed receive gifts of strength, faith, peace and courage. The sacrament also unites their struggles with the passion and death of Christ. “It meant an awful lot to me. I had never been touched by a bishop since I made by first Communion and confirmation,” said Jackie Sanville, a resident of Saint André. “I appreciate it very much. It’s very good,” agreed Bea Villandry, another resident. 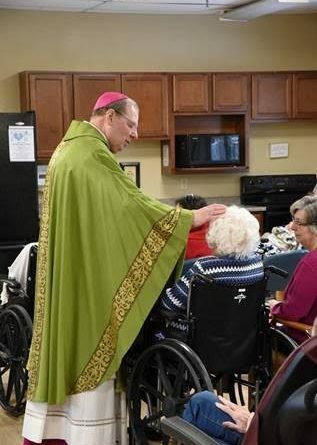 “It’s so important for the bishop to be here anointing our elderly, who are so frail in so many ways,” said Steve Alaimo, CEO/Administrator of Saint André. In his homily, the bishop stressed that everyone has a role to play in caring for the sick. The World Day of the Sick, which is Feb. 11, was introduced by Pope Saint John Paul II in 1992, who called upon the faithful to pray and reflect on those who are sick and struggling. The day coincides with Catholic Church’s celebration of the Feast of Our Lady of Lourdes. On Feb. 11, 1858, the Blessed Mother first appeared to Bernadette Soubirous in Lourdes, France, which has now become a place of pilgrimage and healing. 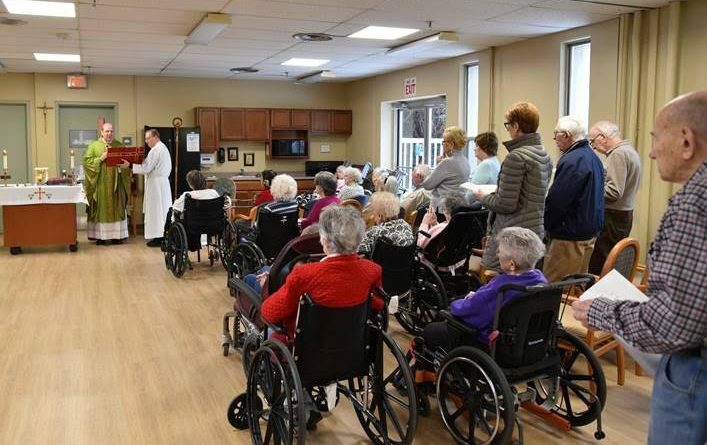 Approximately 75 residents, family members, and health-care workers gathered for the Mass at Saint André, which is a 96-bed residence offering rehabilitation and skilled medical care, short-term respite care, long-term nursing care, Alzheimer’s and dementia care, and palliative and hospice care. It is a member of Covenant Health.